Elite Motor Sports aims to be your go-to provider for car accessories, services and repairs in Woodland. Offering a variety of products and services at competitive prices, we work hard to ensure our customers’ complete satisfaction with our work. Contact us today to learn more about our Woodland auto accessory and repair shop!We offer a variety of services here at Elite Motor Sports, including window tinting. In this blog post, we’ll look at a few examples of how tinting your vehicle’s windows can be of benefit to you. While we’ve talked about how tinting your vehicle’s windows can protect you from harmful UV rays, it’s not just your sight and skin that are being protected. Think about the amount of time that your vehicle sits dormant in bright and sunny weather. From parking it in parking lots for hours on end to leaving it on street, exposed to sunlight, those harmful UV rays can also cause the interior of your vehicle to experience various amounts of wear and tear. From causing your upholstery to crack and damage to making your dashboard fade, harmful sun rays can cause significant damage to your vehicle’s interior. By tinting your windows, however, you can enjoy the benefit of your interior being shielded from these effects, ensuring that your vehicle’s interior will continue to look fantastic for years to come. While you may not be a celebrity, all people need some privacy from time to time. Whether you’re using your vehicle to drive to and from work each day or serve as a driver for another person, sometimes the last thing that we want is feeling as though we don’t have enough privacy when we’re behind the wheel. Tinting your windows can provide you with an added sense of privacy, though it doesn’t limit the amount that you are able to see from the inside. You can still enjoy all the benefits of having untinted windows, plus the added feature of increased privacy. Tinting your car’s windows come with a variety of different benefits, functional and otherwise. Many people choose to tint their vehicle’s windows simply on the basis of aesthetic value, and this is incredibly common. Tinting your car or truck windows can help you increase its overall appearance. When we pass vehicles with tinted windows, we immediately think of it as being of a higher level of quality. 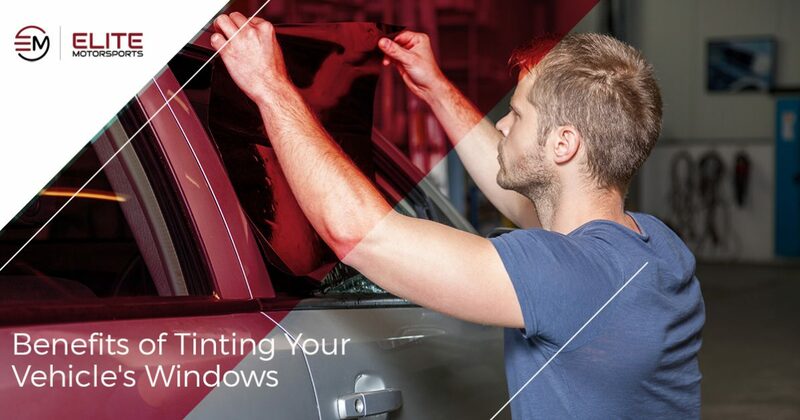 Tinting your vehicle’s windows can help you not only increase it’s aesthetic appeal, but also it’s value should increase should you decide to resell it at some point in time. Tinted windows are an incredibly desirable feature on vehicles, and by tinting your vehicle’s windows, you can increase it’s values in more ways than one. Those are just a few examples of how tinting your windows can be of benefit to you. Whether you’re looking to enjoy some of the aesthetic benefits of window tinting or are looking to extend the life of your vehicle’s interior, tinting your windows can be of great benefit to you. For those of you looking for vinyl wrap and window tinting services in Woodland, look no further than the professionals at Elite Motor Sports. We aim to be your go to provider of window tinting in Woodland as well as car accessories, services and repairs. Get in touch with us today to learn more about how we can best serve your Woodland auto accessory and service needs!